Andrew Garfield sings "Spider-Man" theme on "The Tonight Show"
Now this is a "Spider-Man" musical we'd line up to see. 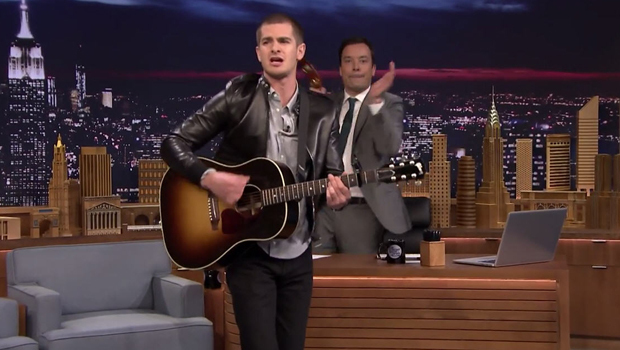 Andrew Garfield sang the web-slinger's classic theme song during an appearance Thursday on "The Tonight Show." "The Amazing Spider-Man 2" star told Jimmy Fallon he had been taking guitar lessons, and then the host presented Garfield with a guitar and asked him to play something. "I am no Adele Dazeem," he joked, adding, "This is the first time I've ever sung in public." But he obliged and launched into the tune about that friendly neighborhood Spider-Man. A delighted Fallon joined in, as did the show's band. Garfield isn't not the only "Amazing Spider-Man 2" star to make a big musical impression on "Tonight" -- earlier this week, his co-star (and real-life girlfriend) Emma Stone faced off against Fallon in an epic lip-sync battle.